Ben Thompson has been creating art in some form or another since he was able to hold a pencil. While pictures of barbarian beheadings and demon eviscerations could often be found on the backs of math homework or the insides of textbooks, his infinitely patient mother and father continued to cheer him on towards a career that gives most parents a sinking feeling in their stomach. 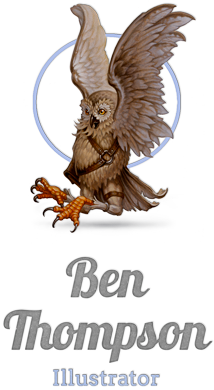 Ben graduated from the Laguna College of Art and Design, and immediately began teaching as a professor in the Illustration departments of Cal State Long Beach and Mt San Antonio Community College during the day and spending many a weekend and sleepless night on his freelance work for such companies as Wizards of the Coast, Upper Deck Entertainment, Alderac Entertainment Group and many others. 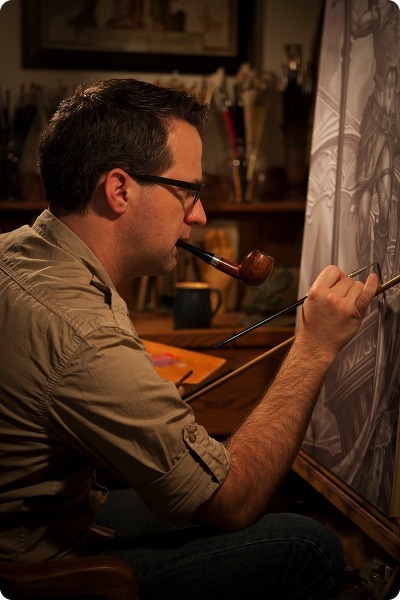 After 5 years he was invited by Keith Parkinson to become a concept artist for the newly formed video game developer Sigil Games Online, where he would eventually take on the role of Assistant Art Director. Upon completion of the project, he accepted a position at Upper Deck Entertainment where he art directed the World of Warcraft trading card game for two years, providing him with the opportunity to work with many of his fellow illustrators in a new capacity. Currently Ben is employed at Blizzard Entertainment where his role combines both his illustration and art direction skills, making for a perfect storm of creativity that he shares with some of the most talented individuals in the industry. Ben currently resides in Southern California with his incredibly supportive wife Helén, all the while making time for as many paintings, books, guitar, and exceedingly large cups of coffee as he can.